GER Engine Specialists is a family owned and operated business established in 1988, with over 130 years combined experience in the automotive industry. From humble beginnings, GER Engine Specialists started out as Glendene Engine Reconditioners, after John & wife Rachel had the opportunity to buy the business he had been working in for the previous few years. Fuelled by his passion for engines and all things automotive, it didn’t take long before the business expanded and a number of relocations led them to Cartwright Road in Glendene. Come 1997, and through the strong family interest in motorsport, John’s son, Scott, upon finishing school, followed in his dad’s footsteps, joining the family business as an apprentice. Over the next 10 years, the business continued to grow and more staff were taken on. 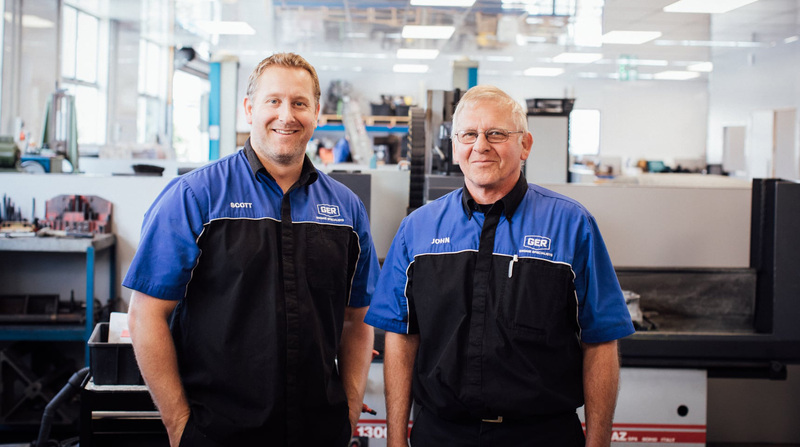 In 2005, Scott bought into the business and in 2015, rebranded to what is now known as GER Engine Specialists. The following year, in 2016, Scott and wife Shannon were excited to have the opportunity to take over the family business. From a very young age, Scott could be found under the car “helping” John with his racing projects. Many family weekends were spent at the race track, either watching John race or watching other race meetings and so it was only natural that not only would Scott go on to join John & Rachel in the family business but also share in his love of racing and start building his own classic race cars. This is a passion that he now gets to share with his oldest son Alex. The jury is out on whether younger son Ryan will also have the racing bug! After being a part owner of the business for 12 years, Scott was excited when the opportunity to take over the family business arose and in 2016, he and wife Shannon took over GER Engine Specialists. John started his career in Automotive Machining as an apprentice in 1968. Over the years he worked his way up the ranks and was managing a workshop when he was made redundant in 1982 due to a company buy out. Going for a complete change of scenery, John and wife Rachel became milk vendors and for 3 years, John would spend his evenings delivering milk in the local area, while working part time during the day for a friend’s recondititioning business out of his basement garage. Sadly, his friend and boss passed away and so when the opportunity to buy the business came up, it was bittersweet. John & Rachel took on the challenge and proudly built Glendene Engine Reconditioners in to a leading engine building business. Following his passion for all things motor related, he also started his own project, building a Capri from the ground up and by this stage, having 3 young sons, it wasn’t unusual to have 4 pairs of legs sticking out from under the Capri and this is where the family love of all things motorsport was born. Keeping things in the family, they were glad to have Scott follow in John’s footsteps, joining the family business and going on to part own and then more recently buy the business. John has been racing his same Capri for over 20 years now and you’ll still find him at the track often with all 3 sons, either racing along side him or keen spectators.